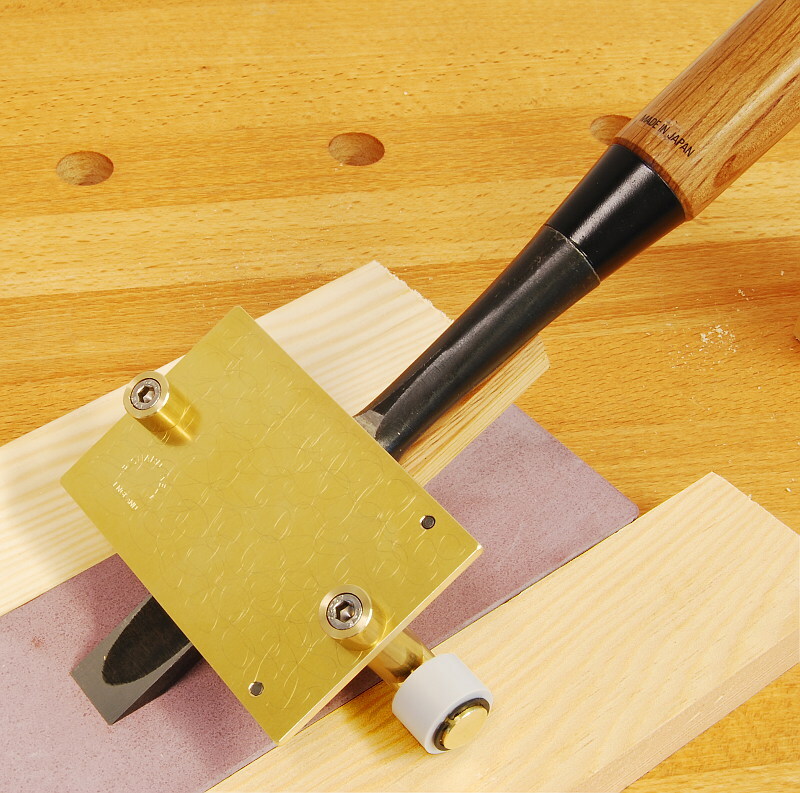 A honing guide is really an essential for sharpening plane irons and chisels if the intention is to maintain or renew a clean, straight bevel. 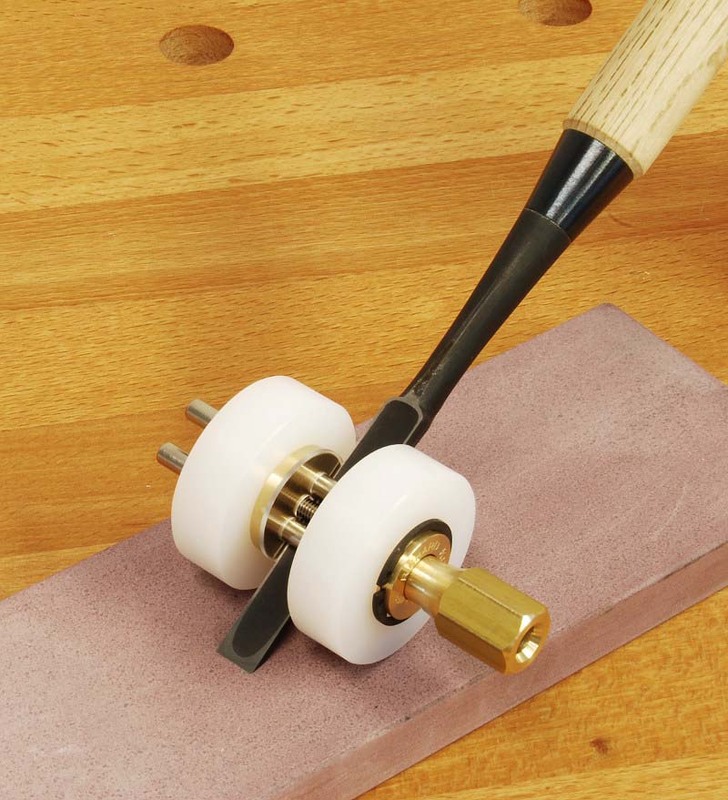 In fact, the aid is the only way for a beginner to manage this at all, and it is appreciated by the expert sharpener because it makes the job so much faster and easier. Not all the aids are all things to all blades. Japanese and European tools, being differently designed, present different challenges to the honing guide. Always take care to fix the tool in the guide at as near to 90° as you can. 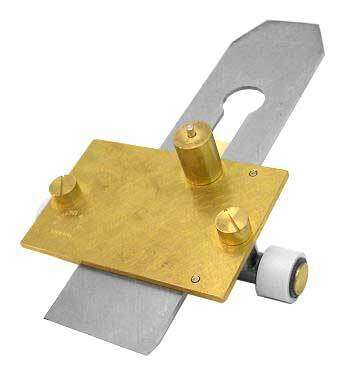 This is especially important for planes with a narrow throat and no adjustment for the blade. 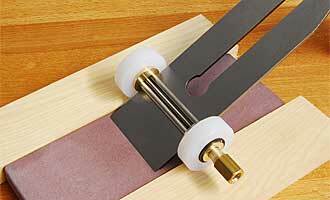 This honing guide has been developed to cope with narrow and short blades. 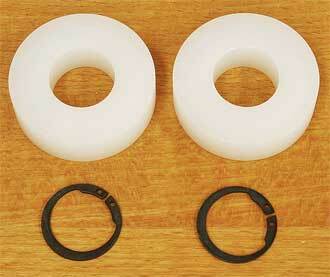 Capacity zero to 1 inch/26 mm! Made by Richard Kell in England! 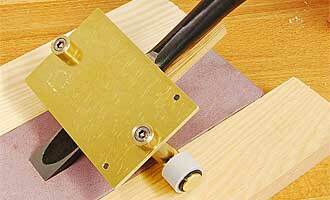 The Quality and workmanship of this honing guide is outstanding. 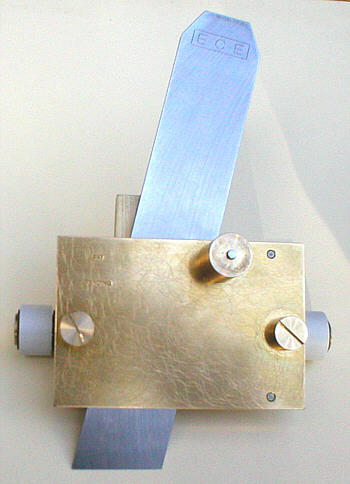 Larger rollers make the Richard Kell no. 1 LGE an absolute winner - faster and smoother action! 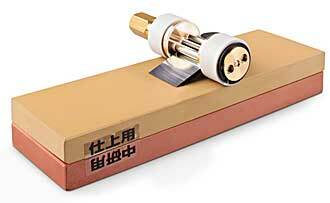 Designed to cope with narrow, short blades or Japanese chisels capacity 0 to 1 inch. Unlike a lot of other guides the relevant working underside of the chisel is used as the correct datum, making contact with the guides two stainless steel location rods. The rollers are expensive Ertalyte TX low friction material, self lubricating. Full instructions included. Larger rollers make the Richard Kell no. 2 LGE an absolute winner - faster and smoother action! 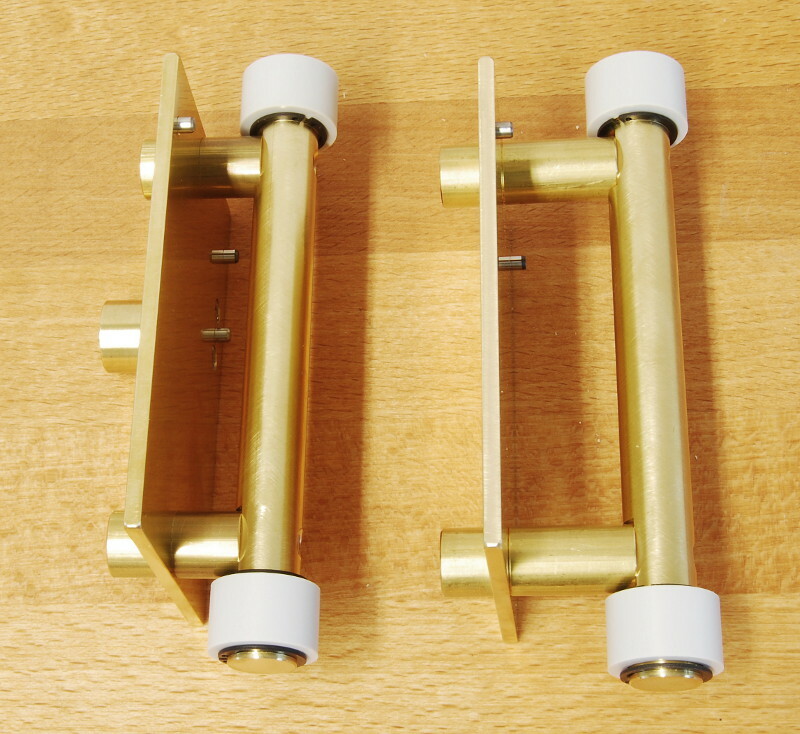 It will easily handle the narrowest to the largest and its clever and unique location method coupled with the excellent side clamping ensures 'spot-on' fast results. 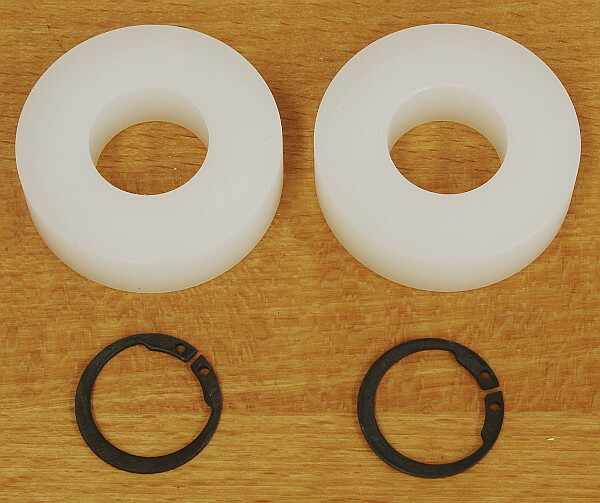 Capacity zero to 60 mm. 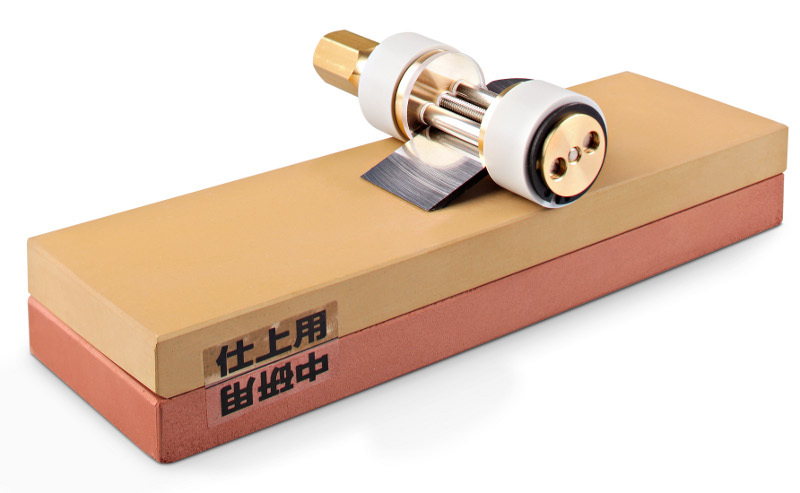 Unlike a lot of other guides the relevant working underside of the chisel is used as the correct datum, making contact with the guides two stainless steel location rods. 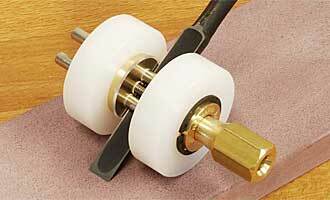 The rollers are expensive Ertalyte TX low friction material, self lubricating. Full instructions included. 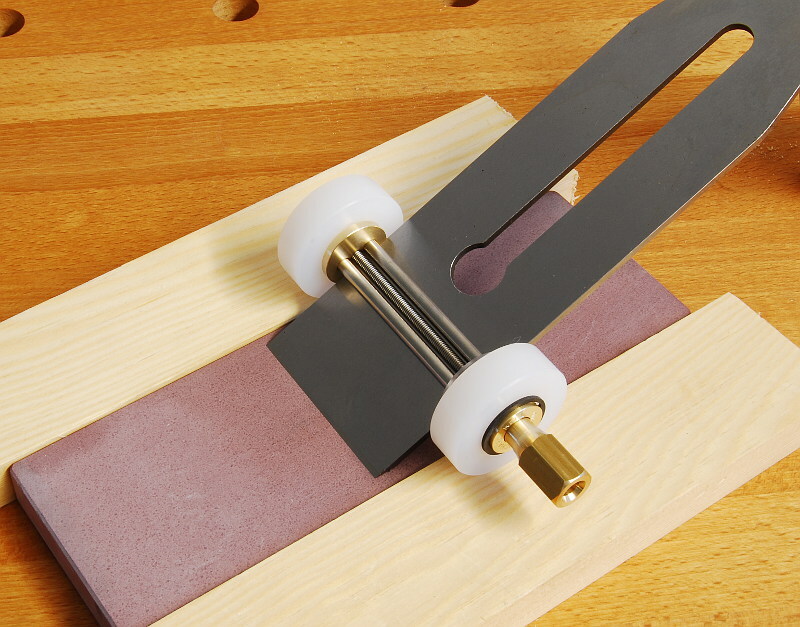 For guided sharpening of skewed blades up to 2 inch (51 mm) width, depending on the skew angle and for straight blades up to 2-5/8 inch (67 mm) width. 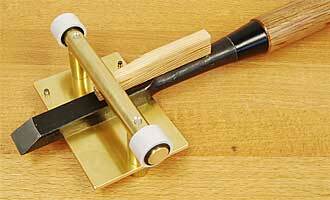 This honing guide also copes with conventional square ended chisels and plane irons. 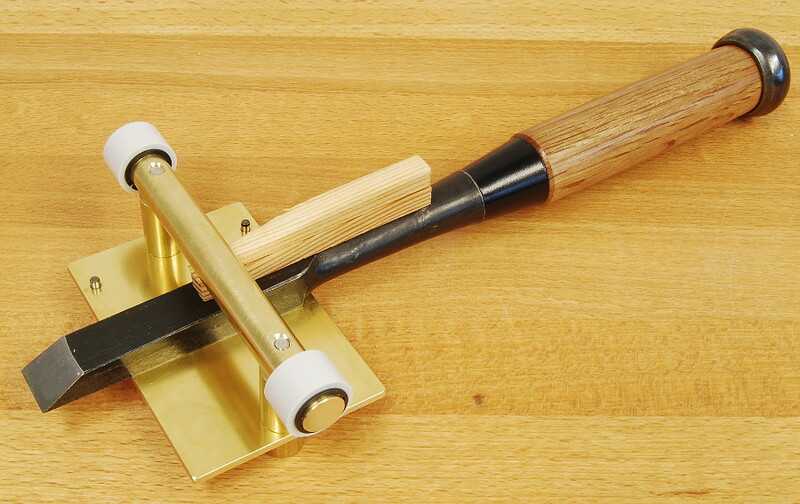 Tip: A slip of paper does a good job of eliminating any slip or movement between the chisel or blade and brass plate and two wedges will cope with all you need. 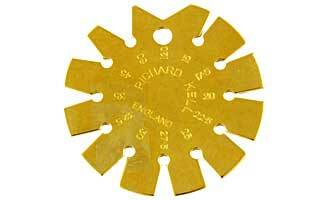 Massive sturdy wheel spacing ensures the jig is master of the tool. 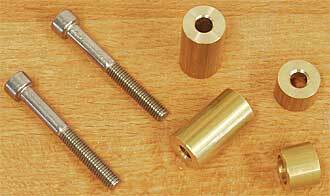 Should you wish to upgrade your existing guide to "deeper working throat" an upgrade kit of longer screws and spacers is available. 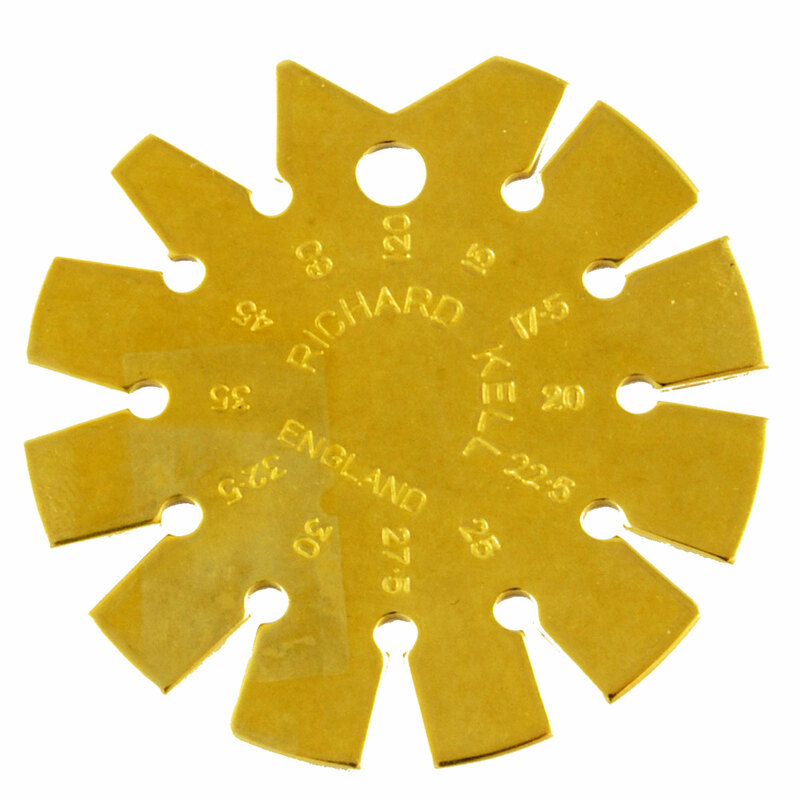 indispensable for all grinding an honing, the Richard Kell Bevel Gauge allows the easy and accurate checking of all grinding and honing angles. The circular cut-out at the top of the bevel apex allows accurate checking without the carefully prepered cutting edge coming into contact with the gauge body. Made in England. 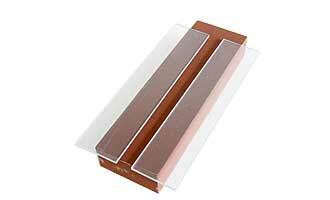 With this pair of polycarb strips ie "3 mm risers" you can give a final finish hone to any chisel or blade. 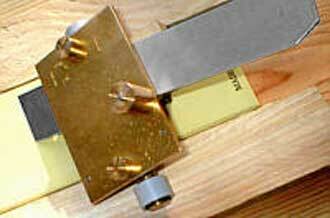 They provide a five degree final lift for finish honing. 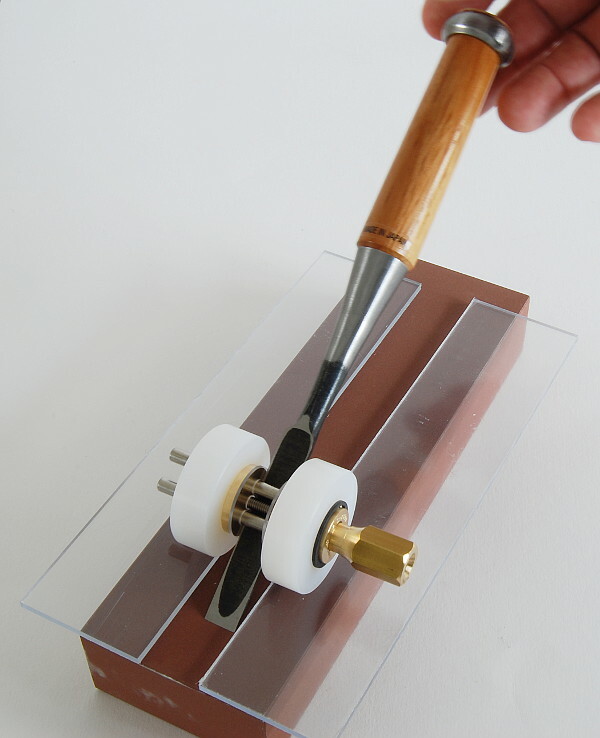 These allow the guide without any re-setting to throw up that final finish bevel and because the whole procedure is so well controlled you can achieve far more resharpenings before needing to rough hone again. 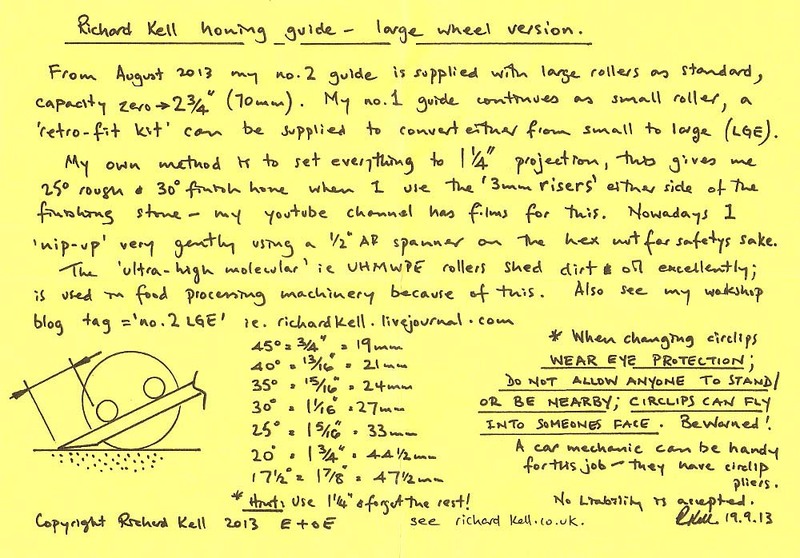 Suitable for all Richard Kell Honing Guides. Size 194 x 44 mm. 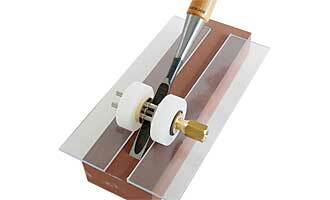 Note: Waterstone, chisel, honing guide NOT included! 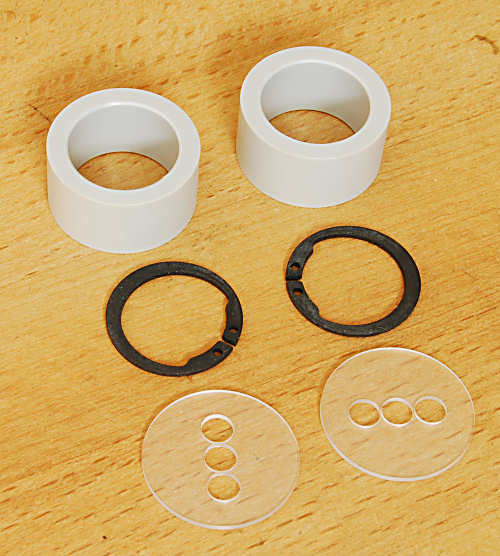 consisting of 2 Rollers diameter 20 mm, 2 Polycarbonate Washers, 2 Circlips. 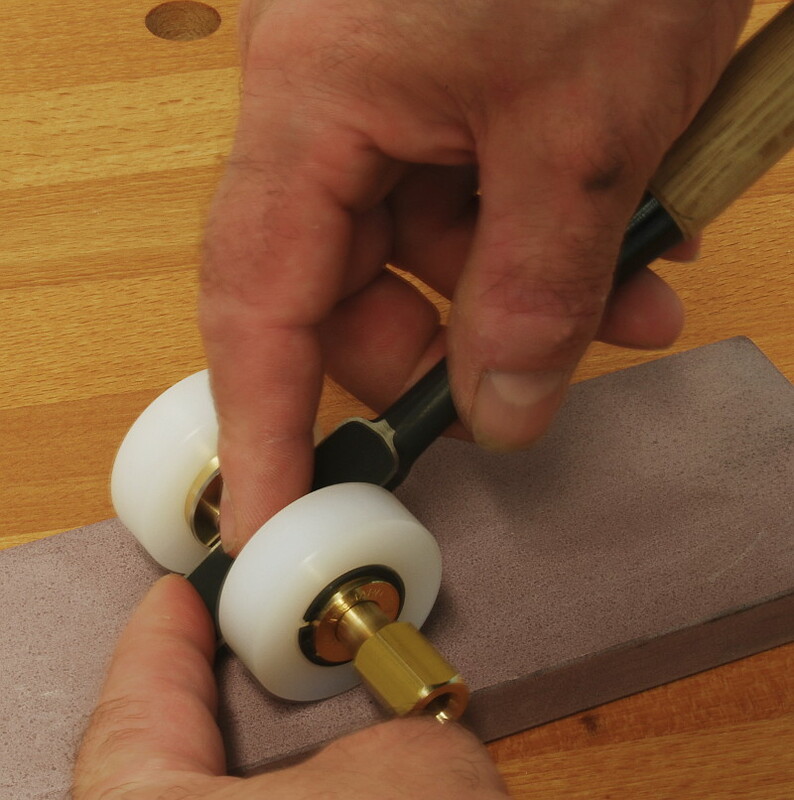 Fit all Richard Kell Honing Guides with small wheels (Diameter 20 mm). Warning: Circlips can be dangerous, you must wear eye protection and clear others from the area when changing rollers! consisting of 2 Rollers diameter 40 mm and 2 Circlips. consisting of 2 screws and 4 spacers. 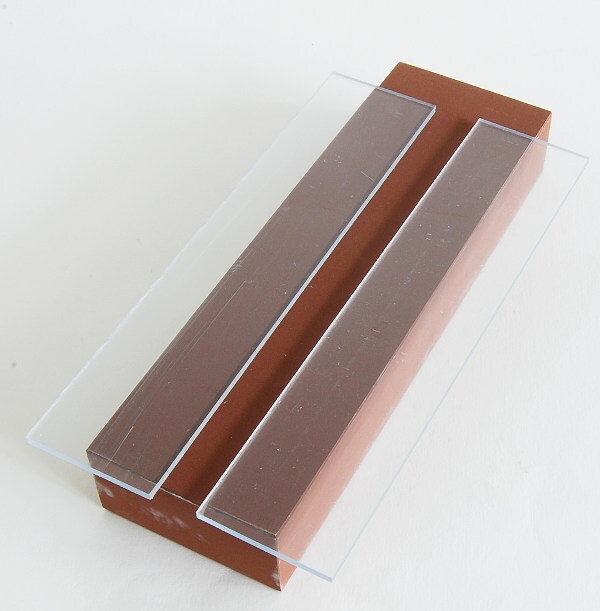 increases the space available for chisel and wedge from 11 mm to 21 mm.